A range of mistral machines to suit every application. No gimmicks, no plastic, just solid quality backed by 40 years continuous production in the UK. 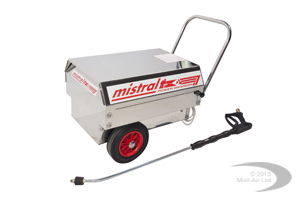 Reliable, hard working machines designed to give you in excess of 20 years hard daily use, which is why all mistral pumps have a 10 year warranty. 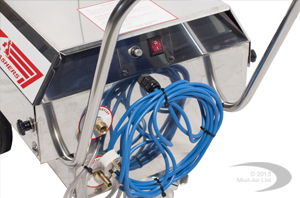 We manufacture two electrically driven COLD WATER power washers. mistral build in dependability, not fussy gimmicks. The controls are simple and straight forward. Under the casing, British engineering excellence. mistral's I0 year warranty tells it's own story. Hard working machines built with the finest materials and the best components. mistral provides you with the power to handle all those awkward jobs in tough locations. 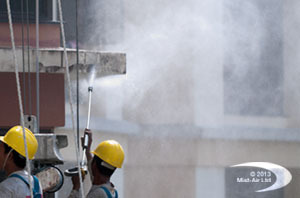 Once your on site you can depend on mistral. • Housed in a fully enclosed steel cabinet, fitted with a hinged cover. • Mounted on two solid 8” wheels with a swivelling locking castor for ease of movement. fitted with ceramic pistons and stainless steel valves to ensure long life. leave these for the hobby market! Length: 680 mm Width: 530 mm Height: 480 mm Weight 70 kg. l 3 meters / 10 feet of suction hose c/w weighted suction filter. l Detergent injection system, with an adjustable nozzle on the end of the hand lance for chemical application when required.